HARTFORD – April 5, 2017 – Hartford Parking Authority (HPA) is eliminating the need for parkers to display payment receipts on their dashboards while parking downtown. In January, HPA upgraded its aging payment kiosks with new technology. 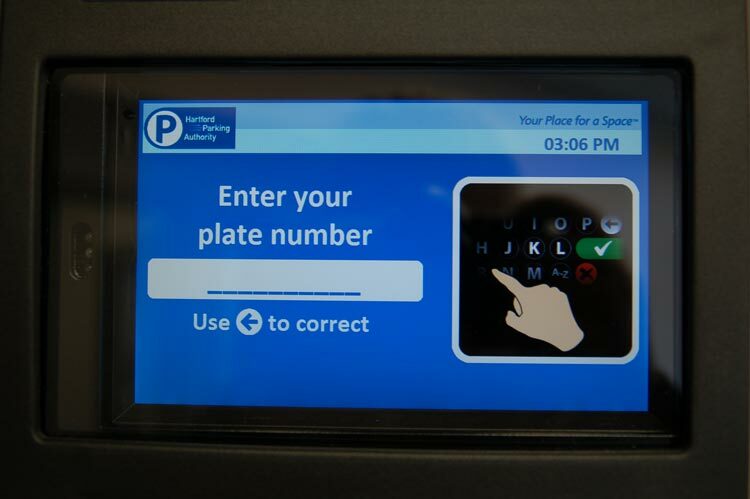 Since the upgrade was made, the parking kiosk display screens have requested license plate information in order to to get parkers in the habit of entering their license plate letters and numbers when parking. As of April 17th, parkers will no longer be required to display their payment receipts, however, parkers must properly enter their license plate information. “Eliminating the need to display payment receipts is the next step in our progress for more efficient and convenient parking downtown,” said Eric Boone, Hartford Parking Authority CEO. “Pay-by-plate reduces time spent parking, as well as prepares downtown parkers for subsequent improvements and conveniences, such as a mobile phone app.” Boone added. The Hartford Parking Authority (HPA) meets the needs of parkers Citywide by consistently providing convenient and affordable parking, and strives to be a leader by incorporating parking industry best practices and actively partnering with the City of Hartford in promoting economic and community development. The HPA oversees metered and regulated parking spaces on Hartford streets, as well as operates and maintains the City-owned MAT Garage, Sheldon Street Lot and DoNo Surface Lots. For more information, contact the Hartford Parking Authority at 860.527.7275 or visit www.hartfordparking.com.